With the development of computer and Internet technology, sharing and storing multimedia files on a computer has become less cumbersome than it used to be. For this reason, many kinds of electronic products have grown rapidly such as the smart phone, MP4 player and video recorder. When it comes to video recorders and camera devices, you will definitely think of several very famous manufacturers just like Canon, Panasonic, JVC and so on. Many of the models they produce have excellent video and photograph features that can almost satisfy almost all your indoor and outdoor video needs. Recently my friend bought a JVC Everio R for his club activity. Just the other day he told me he had some problems about his new camera JVC Everio and asked me for help. He used Everio to record a lot of interesting videos in club activities which he wanted to share with his friend. The problem is that he don’t know how to burn JVC Everio video to DVD, hence what he eagle is an efficient software program which can burn videos to DVD for him in a better way. I don’t think he is the only one suffering this problem. For this reason, today in this post I will help you to burn JVC Everio to DVD. Part 1: Know about JVC Everio? As we all know, JVC is the abbreviation of Victor Company of Japan, a Japanese international professional and consumer electronics corporation based in Yokohama, is best known for introducing Japan’s first televisions and JVC is also one of the world’s leading companies in the field of the Video Home System video recorder. JVC Everio series cameras like JVC GZ-MG, GZ-MS, GZ-MC, GZ-HD, GZ-HM, etc. series record and save video files in MOD or TOD format. Because of its excellent recording function and great endurance ability this series have been popular with many photography amateurs. However, you can see that its output format just include MOD and TOD format, which means that we cannot export JVC Everio video to DVD disc directly. The most efficient way to burn JVC Everio to DVD is to use JVC Everio to DVD Burner, only by this way can we burn videos to DVD from JVC Everio without barriers. From above we learn that a JVC Everio to DVD Burner is necessary for us to burn JVC Everio videos to DVD. Fortunately there are lots of JVC Everio to DVD Burners on the Internet, but it is not easy to find a burner that is both reliable and easy to use. So in this part I will recommend you the best JVC Everio to DVD burner to you- Leawo DVD Creator. Leawo DVD Creator is one of the popular DVD burners around the world, which is a top-of-the-class DVD burner software program equipped with the ability to convert video in many video formats to DVD. 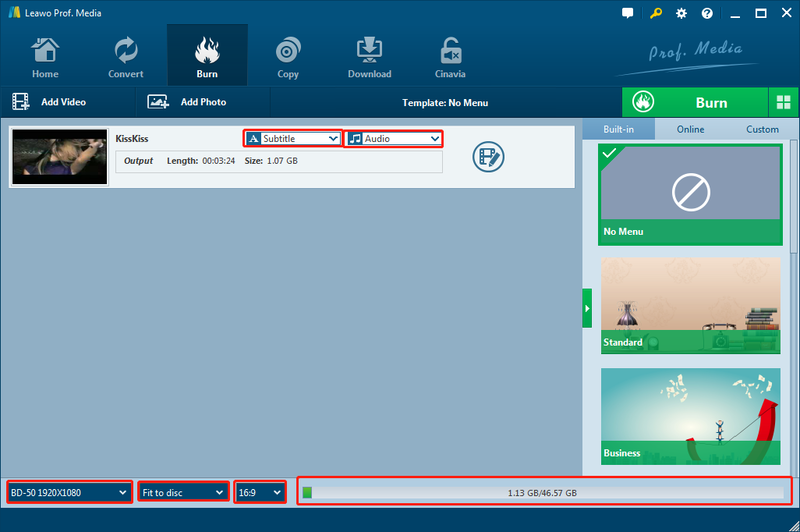 It can support more than 180 formats including AVI, MKV, MP4, MOD, Xvid, MOV, and FLV. With the support for Intel Quick Sync acceleration technology, Leawo DVD Creator can ensure you the fastest burning speed whatever the format you are burning. More than that, its high output quality is also one of the reasons making it more popular than other DVD burners. You can enjoy the original quality of videos on your DVD player by using Leawo DVD Creator. In addition to these two outstanding features, Leawo DVD Creator has a lot of commendable functions such as video edition, add 3D effect, add watermark and crop video and so on. There is no doubt that you can use Leawo DVD Creator to burn JVC Everio to DVD. With fast speed and high quality, I promise that Leawo DVD Creator must be your best choice. After a simple brief of Leawo DVD Creator, what I’m going to do is to tell you how to use Leaw DVD Creator to burn JVC Everio to DVD. In the first place you need to transfer your JVC Everio videos to your computer or connect your camcorder to a computer with mini-jack to USB cords, and then to load the videos to Leawo DVD creator by clicking the “Add Video” button. The invert triangle button next to the “Add Video” button can help you to import the whole video folder or you can just drag them into the main interface. If you’d like to design the disc menu by yourself, the right sidebar will help you a lot. You will find there are many disc menu templates in different themes like Standard, Business, Education, Childhood, Holiday, etc. 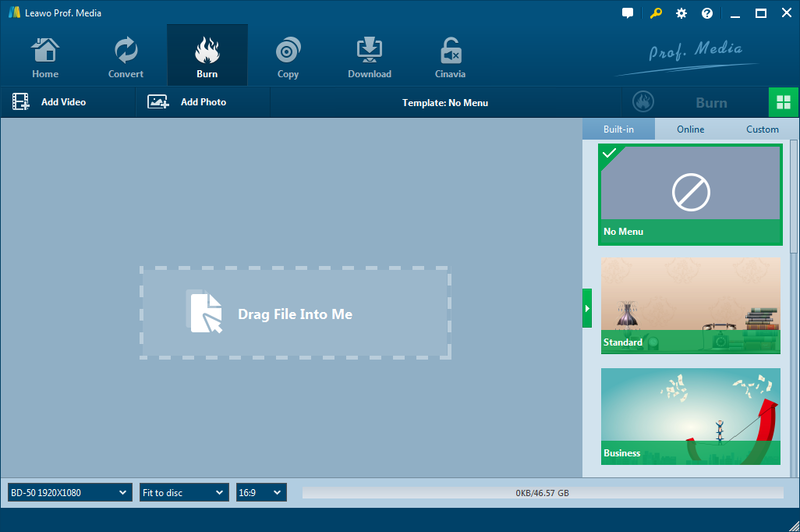 What’s more, you can even design the disc menu with your own image and audio as well. And if you prefer to keep the original style, “No Menu” option will help you to undo all the settings. After setting disc menu, click the big green “Burn” button to call out the burning settings panel, on which you need to figure out Burn to, Disc Label, and Save to options. After that you can get start to burn JVC Everio to DVD by clicking the “Burn” button on the popup burning settings panel. To be brief, as a JVC Everio to DVD Burner, Leawo DVD Creator is perfectly capable of this task. I can assure you that it will satisfy you in not only burning JVC Everio to DVD but another conversion job with the fast burning speed and the best converting quality. Other than burning JVC Everio videos to DVD, it also supports burning videos from other cameras like burning Canon videos to DVD. If you are tired of finding various kinds of DVD burner, I think Leawo DVD Creator will be your favorite DVD Creator which can meet your needs all the time.